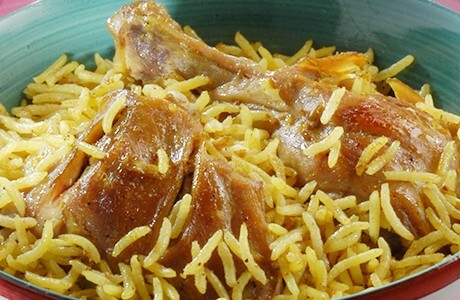 Pilaf is a delicious dish in which the rice is stirred through with onions as well as a mix of aromatic spices. This version, which contains tender chicken and spices, couldnâ€™t be easier to make. Heat the ghee / oil in a heavy-bottomed pan over moderate heat; add the onions and sauté until translucent. Then add the ginger; garlic, and green chillies; continue to fry until the mixture turns golden brown. Uncover the pan, increase heat to high and stir in the rice. Mix the rice and add 3½ cups of very hot water. Cover the pan and bring to the boil. Reduce heat to low and simmer until the rice is cooked and all the liquid has been absorbed.